Bateman, G., ed. All The World's Animals: Songbirds. New York: Torstar Books Inc., 1985. Dunning, J. S. South American Land Birds: A Photographic Guide to Identification. Newtown Square, PA: Harrowood Books, 1982. Foster, M. S. "Chiroxiphia linearis (Saltanix Colilargo, Toledo, Long-tailed Manakin)." In Costa Rican Natural History, edited by D. H. Janzen. Chicago: University of Chicago Press, 1983. Hilton-Taylor, C., comp. 2000 IUCN Red List of Threatened Species. Gland, Switzerland and Cambridge, UK. : IUCN, 2000. Hilty, S. L., and W. L. Brown. A Guide to the Birds of Colombia. Princeton, NJ: Princeton University Press, 1986. Johnsgard, P. A. Arena Birds: Sexual Selection and Behavior. Washington, DC: Smithsonian Institution, 1994. Meyer de Schauensee, R., and W. H. Phelps. A Guide to the Birds of Venezuela. Newtown Square, PA: Harrowood Books, 1982. Ridgley, Robert S., and G. Tudor. The Birds of South America. Vol. II: The Suboscine Passerines. Austin: University of Texas Press, 1994. 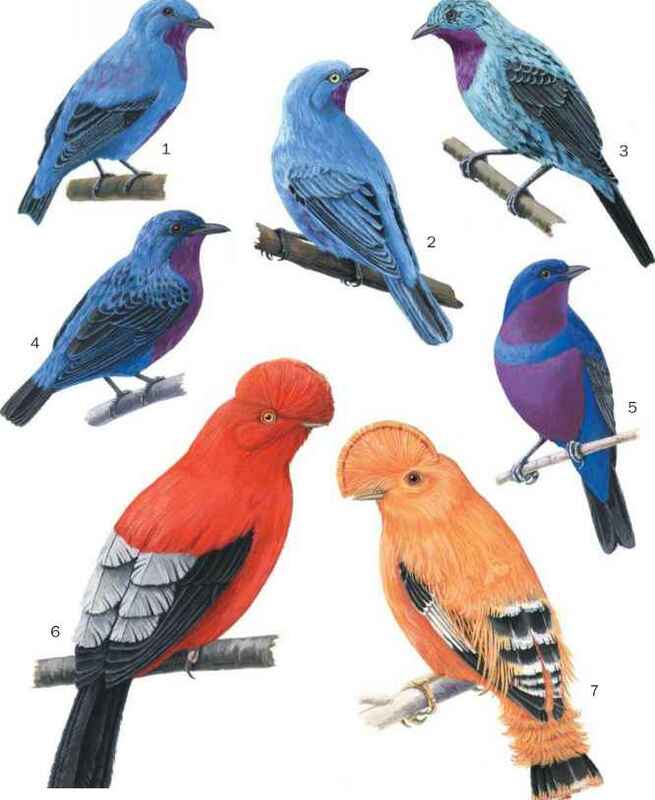 Sibley, C. G., and B. L. Monroe, Jr. Distribution and Taxonomy of Birds of the World. New Haven, CT: Yale University Press, 1990. Distribution and Taxonomy of Birds of the World. New Haven, CT: Yale University Press, 1993. Stiles, F. G., and A. F. Skutch. A Guide to the Birds of Costa Rica. Utica, NY: Cornell University Press, 1989. (Passeriformes: Pipridae) from Chapada do Araripe, Ceara, Brazil." Ararajuba 6 (1998): 81-84. Foster, M. S. "Odd Couples in Manakins: A Study of Social Organization and Cooperative Breeding in Chiroxiphia linearis." American Naturalist 111 (1977): 845-853. Prum, R. O. "Phylogenetic Analysis of the Evolution of Display Behavior in the Neotropical Manakins (Aves: Pipridae)." Ethology 84 (1990): 202-231. Prum, R. O. "Sexual Selection and the Evolution of Mechanical Sound Production in Manakins (Aves: Pipridae)." Animal Behaviour 55 (1998): 977-994.